INDIANAPOLIS (AP) — Urban Meyer arrived in Indianapolis on Friday with one goal — heading home with another Big Ten championship trophy. He treated everything else as a sideshow. 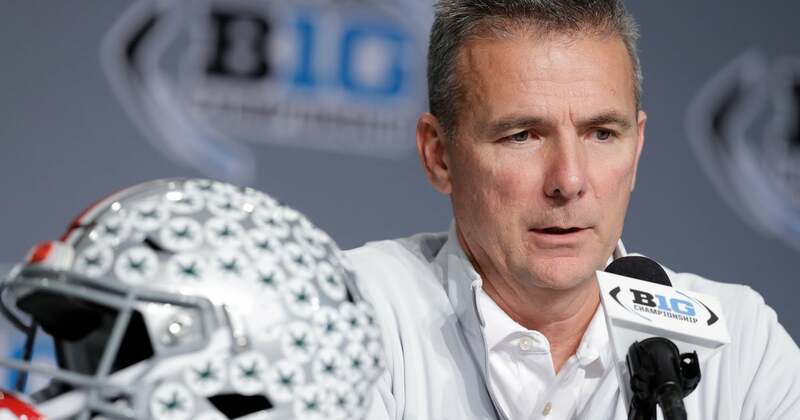 Meyer ignored speculation about his coaching future and deflected talk about what No. 6 Ohio State would need to earn a spot in the college football playoff. Instead, Meyer stuck to the same message he’s relayed to his team all week: Just focus on football. Being back in Indy for another shot at the title and yet another possible playoff berth should be a relief in itself. “Uh, no comment on that,” Meyer said when asked Friday about a report that next season would be his last in Columbus, Ohio. Northwestern, meanwhile, continues to embrace playing the underdog. Few expected the Wildcats (8-4, 8-1, No. 19) to dethrone Wisconsin in the Big Ten West, especially after losses to Duke, Akron and Michigan in successive weeks in September. But their only other stumble came against Notre Dame, another playoff hopeful, and now it appears Northwestern is one win away from reaching its first Rose Bowl since coach Pat Fitzgerald was a Wildcats’ player in 1995. It’s Northwestern’s first appearance in Indianapolis and one Fitzgerald believes is overdue. Again, the doubters give the Wildcats no chance against the suddenly resurgent Buckeyes. Ohio State was installed at a two-touchdown favorite Saturday, one week after they hung 62 points on one of America’s stingiest defenses. They’re led by Big Ten offensive player of the year Dwayne Haskins, who set conference single-season records for yards passing (4,081) and touchdown passes (42). And while Northwestern relies on an old-school style, Fitzgerald knows just how well the Wildcats must play to give themselves a chance against a team that seemingly needs a huge win to impress the selection committee. Meyer may not believe his team needs in style points. His players understand, though. Haskins was the obvious choice as this season’s top Big Ten player. How obvious? Meyer’s anguished sideline demeanor has sometimes led to speculation he could soon retire. He has acknowledged a cyst in his head flares up and causes severe headaches during stressful times. One such headache dropped him to a knee during an October game. The stress was compounded by a three-game suspension to start the season for his mishandling of a now-fired assistant who was accused of domestic abuse. When asked how he felt earlier this week, Meyer said “good” before steering the conversation back around to football. While Fitzgerald said he treated this week like a normal road game, it’s not. Fifty buses full of students are expected to make the trek from Evanston, Illinois, to Indy and Fitzgerald hopes the school’s men’s basketball team will swing by Lucas Oil Stadium on its way home from Bloomington. For Northwestern, all this is new.